After a week in Scotland, staying on the shores of the beautiful and enigmatic Loch Ness, it was finally time to leave. So after we had cruised on Loch Ness, discovered waterfalls, explored historic battlefields, taken a road trip with the Harry Potter train and spotted castles and dolphins the week was sadly but finally over. We had to be out of our self-catering accommodation by 10 am but we had the whole day to enjoy the journey home and make it an extension of the holiday rather than just a seven–hour ordeal! 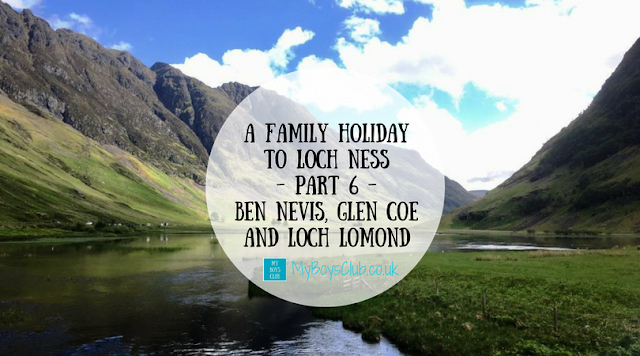 So our journey took us through the Great Glen Way, Ben Nevis, Fort William, Glen Coe, Loch Lomond and Glasgow before crossing the border and arriving back in Newcastle. So all packed up, we waved goodbye to Nessie (just in case) and set off at 10am making our way for the last time (this holiday) along the Great Glen Way through Fort Augustus, past Loch Oich and Loch Lochy and onto our first stop for the day at the amazing viewpoint by the Commander Memorial just before Spean Bridge, from where you have uninterrupted views of Ben Nevis and the Nevis Range. 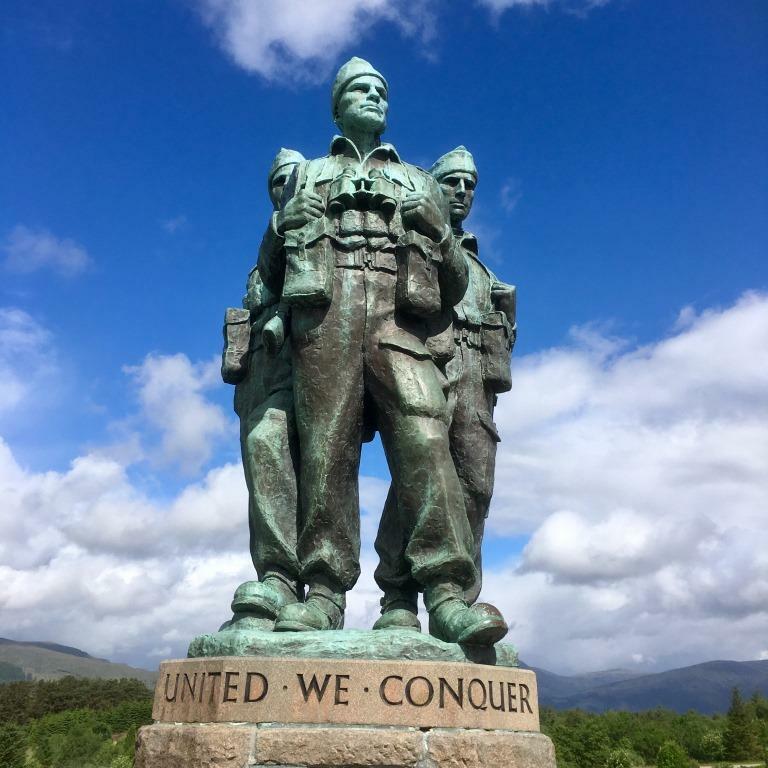 The Commando Memorial is dedicated to the men of the original British Commando Forces raised during World War II. 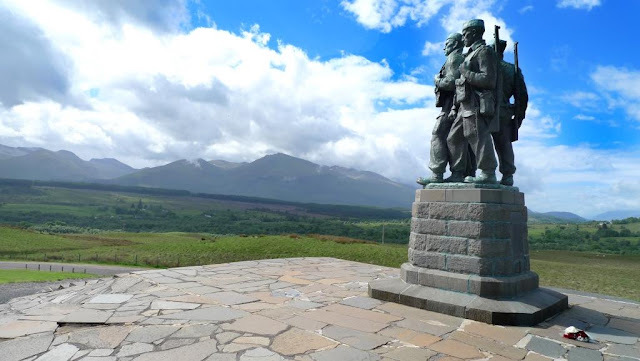 It overlooks the training areas of the former Commando Training Depot at Achnacarry Castle and has become one of the UKs best-known monuments, both as a war memorial and as a tourist attraction offering views of Ben Nevis and Aonach Mòr. After a walk around we headed back out of the large car park and on to Fort William which is around twenty minutes away. From here we followed the shoreline of Loch Linnhe and then Loch Leven on the road that would take us to Glencoe. Oban will just have to wait for another trip to Scotland. Glen Coe is stunning. Before we went I’d read that no description can re-create the impact of seeing Glen Coe for the first time. And it is so true. Beautiful, amazing, awe-inspiring are all words that don’t even do it justice! 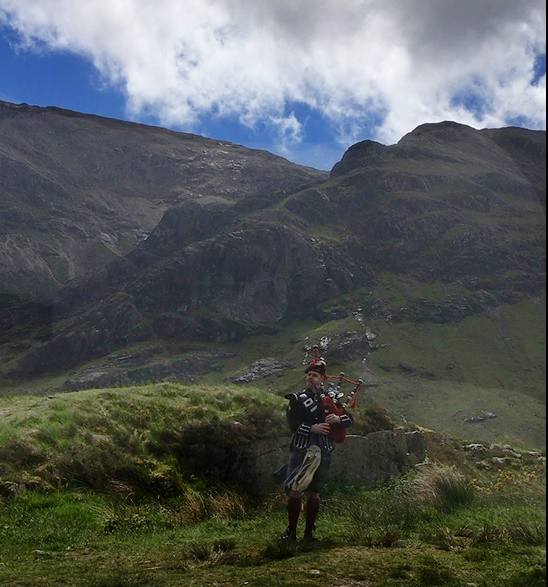 We stopped off three times as there were so many different directions to look in all with stunning landscapes and also a watched a listened to a Scottish Piper play the bagpipes too. A busker with a difference. Be prepared for all weathers although it didn't stop the boys wanting to take photographs. We experienced clear blue skies, blazing sunshine, torrential rain and very windy conditions all in the space of a few minutes apart and that was just from the roadside. In some places you could still see snow in the crevices at the tops of the mountains – I certainly wouldn’t be venturing up them without the right equipment and experience. It was the busiest of all the places we visited in Scotland. The lay-bys were very full with people stopping to take in the views of one of the best known and most historic and scenic glens in Scotland. Thousands of visitors head here every year and many have seen it on film before they arrive too. 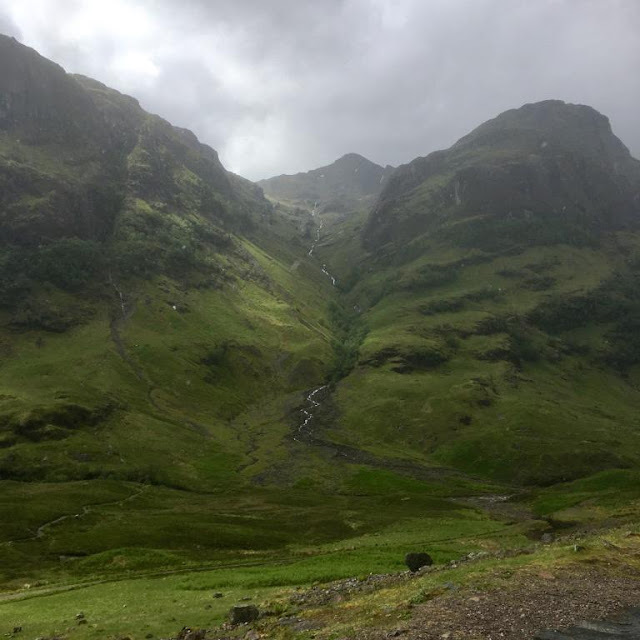 Filming for the third Harry Potter film, Harry Potter and the Prisoner of Azkaban, took place on location in Glen Coe. Other films that have used Glencoe as a location include Skyfall, Rob Roy, Highlander and Monty Python and the Search for the Holy Grail and its currently being seen in The Loch TV series on ITV1. 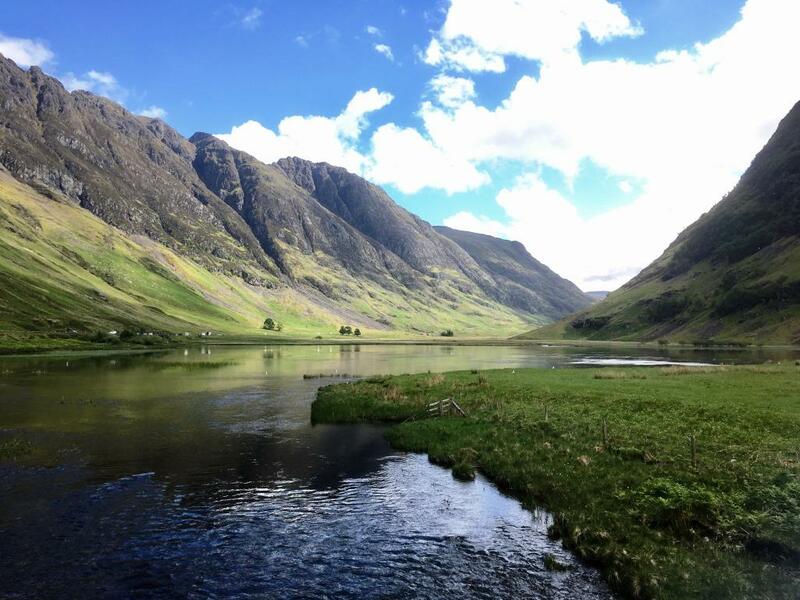 Located within the awe-inspiring Lochaber Geopark in the Highlands, the deep valley and towering mountains of Glen Coe were carved out centuries ago by icy glaciers and volcanic explosions. The road through Glen Coe takes you through the heart of an ancient volcano, after our stops and eating our picnic we headed along this route through the Bridge of Orchy, back towards Loch Lomond. Just before we reached Loch Lomond we looked out for the Falls of Falloch. I’d seen a signpost on the journey north a week ago and thought it would make a good stop off point to stretch the boys' and our legs. It’s very short 5-minute walk from the car park to this popular waterfall and picnic spot, where the River Falloch falls in a single 10m leap, particularly impressive when in full flow. 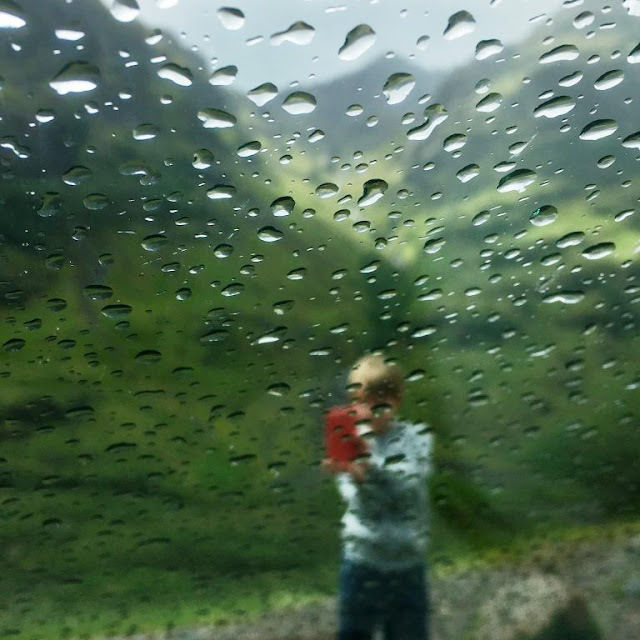 Situated in the north part of Loch Lomond & The Trossachs National Park, photo opportunities are abundant both below and above the falls, and the boys explored both and were mesmerised by the people jumping from the falls too into the deep body of water. They said they’d like to give it a try – but only when they were older. 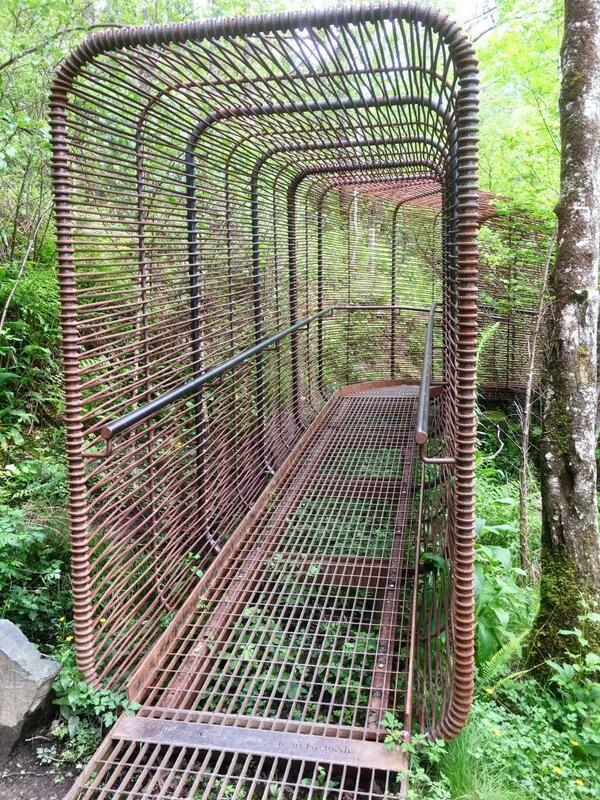 There is even an enclosed viewpoint which makes it safer for children to see. The John Kennedy designed ‘Woven Sound’ viewpoint provides a sheltered space to experience the Falls of Falloch at closer range. The Loch Lomond & The Trossachs National Park boasts some of the most stunning scenery in the world, from breathtaking mountains and glens to the vast tranquil beauty of its Lochs. It would just not have been right to not stop and take in the wonder. One of the Lochs in the national park and probably the most famous is Loch Lomond. The largest inland stretch of water in Britain, Loch Lomond is also one of the most popular destinations in Scotland. The loch, which famously features in the song ‘The Bonnie Banks o’ Loch Lomond’, extends north for 24 miles from Balloch, which is a popular access point to the Highlands. As well as the A82 western shore road that we drove along there is also a traffic-free cycle route. We stopped at Inveruglas which sits within a wooded area on the banks of Loch Lomond with great views across the Loch to Ben Lomond. There is a large car park with toilets and a café too. The Loch Sloy Hydro-Electric Scheme is also located on the shore of Loch Lomond at Inveruglas. But we were only half-way home so were soon back on the road. The next couple of hundred miles or so took us through Glasgow, down the M74 where we passed the signpost to New Lanarkshire World Heritage Site where we visited earlier this year and on to the A69 that would lead us home to Newcastle. Just the journey home had been stunning and the whole week – well it’s a family holiday I’ll never forget. Scotland with kids is all about adventure, discovery, exploring and fun! What's your favourite place in Scotland? Absolutely stunning scenery! I can't wait to visit Scotland, despite the rain! It so is. We'll definitely be going back. It was so lovely. The boys were a great age for it too. So many we didn't get to either. We need to go back. Wow look at those skys! Beautiful!